New exhibit uses immersive digital media to boost creative confidence in art, facilitate social experiments and let visitors fly like a bird. 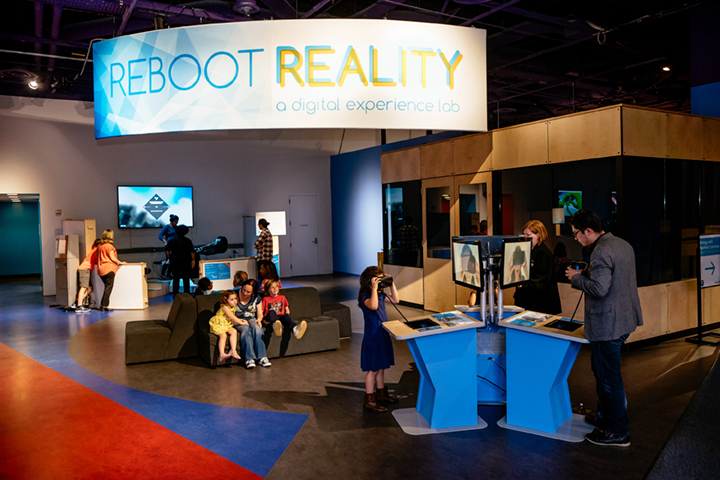 May 16, 2017, San Jose, CA-- Visitors will create new worlds and fly like a bird in The Tech Museum of Innovation’s new exhibit, Reboot Reality. 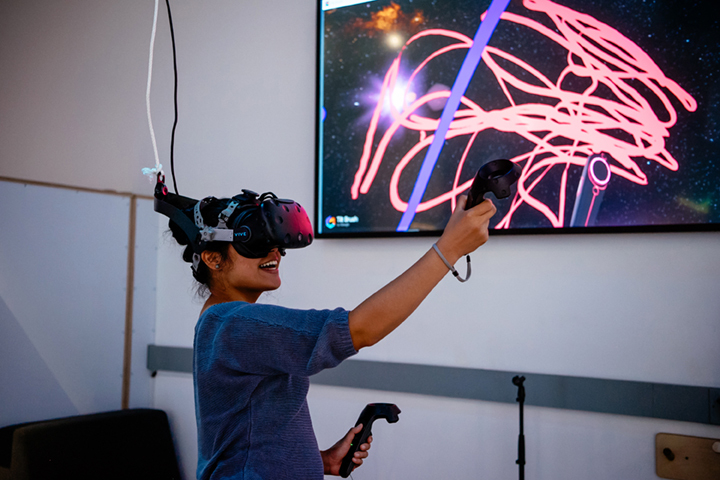 This experimental space, opening Friday, May 26 at The Tech in downtown San Jose, offers a series of immersive activities that allow visitors to create with cutting-edge technology in virtual reality, augmented reality and mixed reality. The Tech is working with some of the biggest players in Silicon Valley digital media, including Adobe, Google, Oculus from Facebook, HP, Stanford University and more. There will also be opportunity for startups to beta test their VR experiences with the public. Reboot Reality is the first permanent home of Birdly, a first-of-its-kind VR flying simulator. 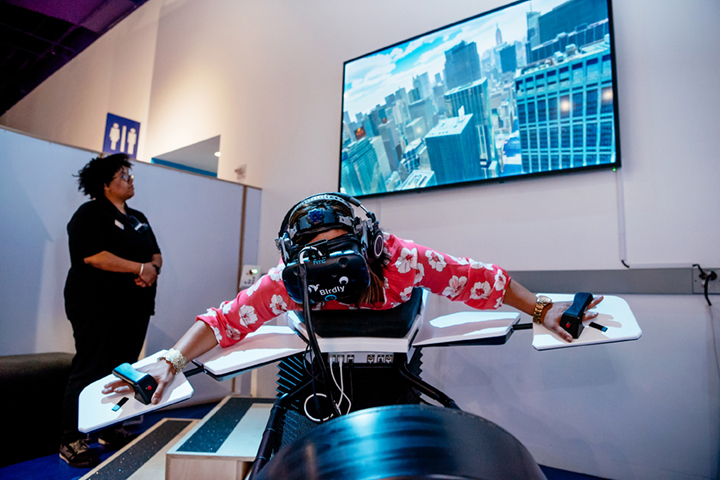 Visitors can soar above skyscrapers, flapping their arms in wing-like panels as their body tilts during “flight.” A fan emits the whoosh of a dive bomb or the gentle breeze of a leisurely glide as visitors steer their virtual avatars across the sky. Creators hope that one day VR technology could make important improvements in education. 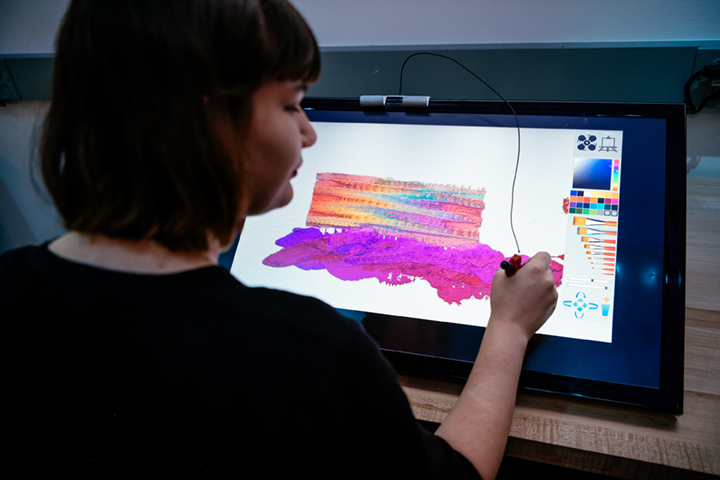 The Tech is the only place the public can bring their artwork to life with Adobe Wetbrush, the first digital painting experience to recreate the textures and colors of real-life oil painting with a physics-based brush and particle simulation on a pressure-sensitive tablet. Users can blend their paints and add complex textures in ways that feel shockingly like the real world. Two experiences in Reboot Reality will transform a visitor’s world into a virtual 360-degree canvas where they can use VR to paint, sculpt and play. 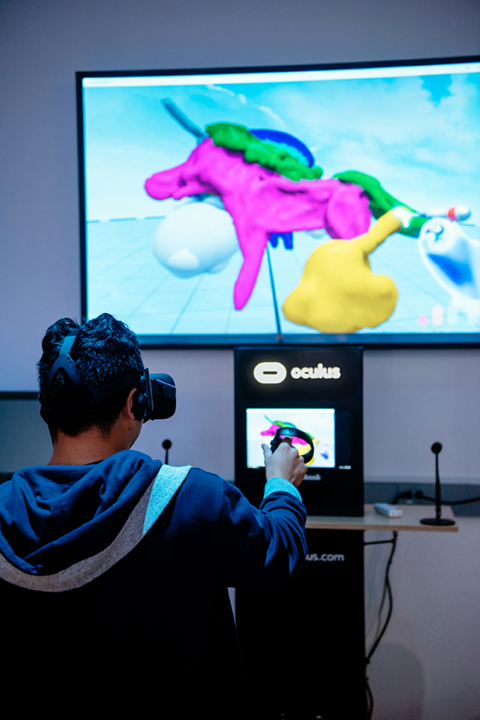 Using a headset and hand controllers, a guest can sculpt with digital clay using Medium by Oculus from Facebook. And in Tilt Brush by Google, visitors pick from a colorful pallet of animated brush options. Visitors can also paint with electrified ropes, duct tape, sparkles and many other options before “walking through” their 3D masterpieces. These experiences can be navigated with ease even by people who don’t feel entirely comfortable with technology. Visitors of all ages will use the Sprout by HP to create a mashup of graphics and photos taken on the spot in a blended digital and physical computing platform that reimagines the computer workspace. They’ll also envision the future of downtown San Jose with a 360-degree glimpse of the Diridon Project — a proposed new downtown office and living space — in a visual experience developed by the architectural firm Gensler. Art meets machine learning in X Degrees of Separation by Google Arts and Culture, where visitors pick two pieces of art, then an algorithm draws connections using a series of images. Researchers from Stanford’s Virtual Human Interaction Lab will also encourage visitors to explore how VR affects the way we feel about ourselves, each other or the environment. Reboot Reality, which opens Friday, May 26, is a permanent exhibit at The Tech with new experiences rotating in periodically. All offerings are included in admission except for Birdly, which is an additional cost. Age restrictions apply. The Tech will host a media preview Thursday, May 25, from 10 a.m. to 1 p.m. Exhibit and tech developers will be available for interview. Please RSVP with mkrause@thetech.org.